The brachial plexus is a delicate bundle of nerves that begins in the neck and travels down the length of the arm, innervating the muscles and skin of the upper limbs. It should come as no surprise that the number one symptom of brachial plexus irritation is arm pain. The problem with this condition is that it’s oppressively constant. During a flareup, the pain is isolated within the arm, lower neck, and shoulder, but at that same time it’s hard to pinpoint. Perhaps the worst part of this condition is that it makes sleeping nearly impossible. Virtually every position intensifies the pain, and no matter what you do to momentarily ease the tension, it comes back with a vengeance. Not only have I helped patients with this debilitating condition, but I’ve also experienced it many times in the past… So I can tell you exactly what worked and what didn’t in these instances. Over-the-counter pain relievers offer a paltry effect at best. Rotational chiropractic manipulation may provide eventual relief, but in my experience it failed to offer “liberation” within a reasonable amount of time. The heat and steam generated from a hot shower proved to be the only at-home remedy I could find that temporarily dampened pain. It wasn’t until I met a chiropractic instructor who specialized in sports medicine that I discovered effective relief. 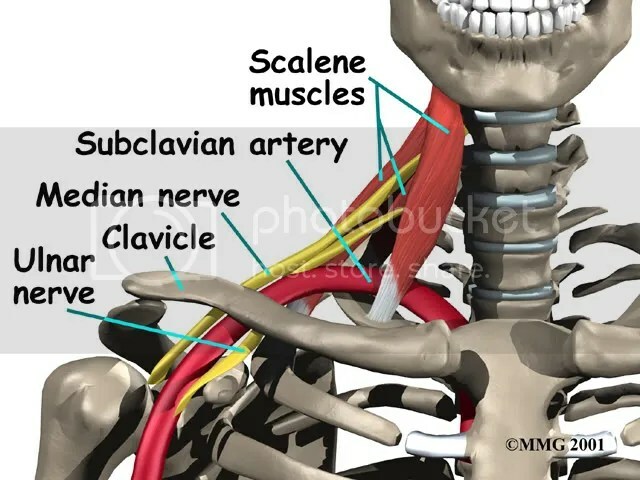 During one of my many flareups with this condition, he released trigger points within the scalene muscles of my cervical spine as well as the pectoralis minor. After receiving this treatment, I’d notice that the pain became bearable, and reduced by nearly 50%. Within 2-3 days the pain was gone. Later I noticed that when I received a precision upper cervical adjustment after having this trigger point work done, the arm pain reduced by nearly 80-90% within just 30-60 minutes, and was gone by the next day. I wouldn’t say this approach is revolutionary, but through personal and clinical experience, I’ve found dependable outcomes. The goods news is that virtually any physical therapist, massage therapist or chiropractor is capable of reducing trigger points. So if you suffer from bouts of arm pain associated with brachial plexus irritation, have them palpate the muscle groups mentioned above and see if they’re tender. If that’s the case, what was once an exhaustive recovery process can now be improved much quicker. As far as the upper cervical correction, make sure you have access to a chiropractor who focuses exclusively on this procedure. I’ve found that the unique approach of Upper Cervical Care not only helps reduce the frequency of flareups, but in many cases can prevent them from happening altogether. Can you recommend a Chiro in Los Angeles that understands this condition and how to treat it? My Chiro does not comprehend and last time he irritated the pain caused a terrible flare up although the trigger points therapy was amazing his correction procedure was a problem. Been dealing with arm and shoulder pain all my life would love to fin a doctor on Connecticut who can help me with this !! Thank you – I found your article very helpful and accurate to describing my condition. I’m puzzled why my GP, chiropractor and orthopedist did not immediately diagnose me based on my precise descriptions of pain and symptoms. I will find a chiropractic, PT and massage team who to properly treat me. In the meantime, thank G-d for Vicodin and muscle relaxers.